Places like this are rare in our busy world. Sometimes it feels as though everything’s already been discovered, packaged up, bought up, and fenced off. But these places still exist. All you need to do is step off the path every once in a while to find them. This was Elise Cook’s experience when her husband Dom surprised her with a spontaneous road-trip to Tasmania a few months ago. It all started when Dom surprised Elise with a trip to Tasmania for their third wedding anniversary. Elise was expecting a return trip straight home to Adelaide from a friend’s wedding in Melbourne, but that’s not what happened. Dom had other plans. You can read about how their month-long journey started in our Road Trip of a Lifetime article here. 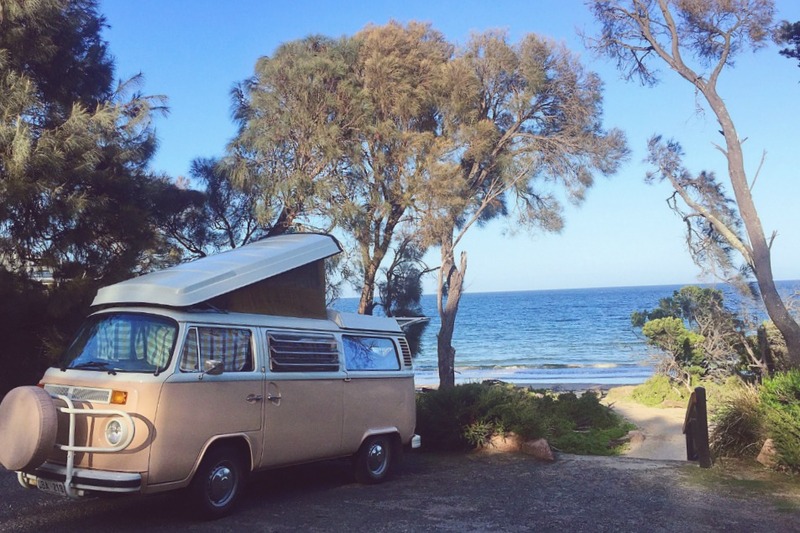 You’re going to love it, especially the part about how they bought their Kombi. 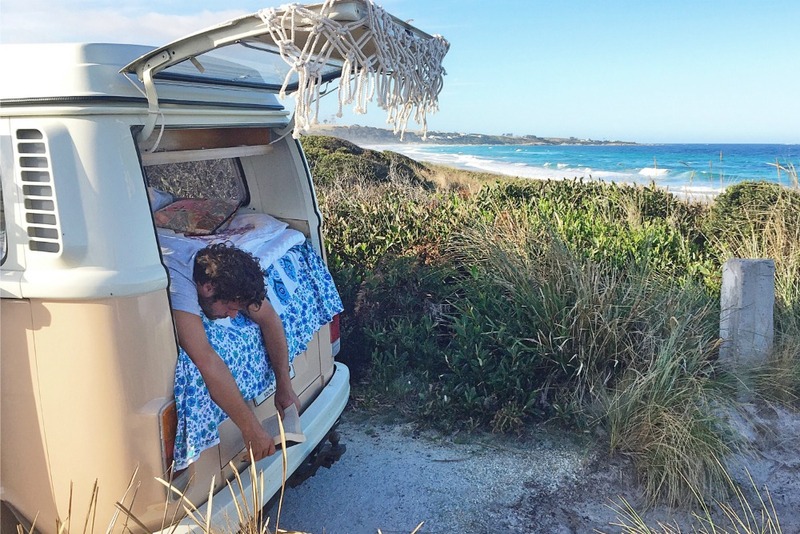 The story of Elise and Dom’s east coast journey is a wonderful, real life account of the freedom that the Great Eastern Drive offers and the adventures to be had along the way. One thing in particular Elise said they loved about Tasmania’s east coast, was the adventure of discovering secluded beaches. 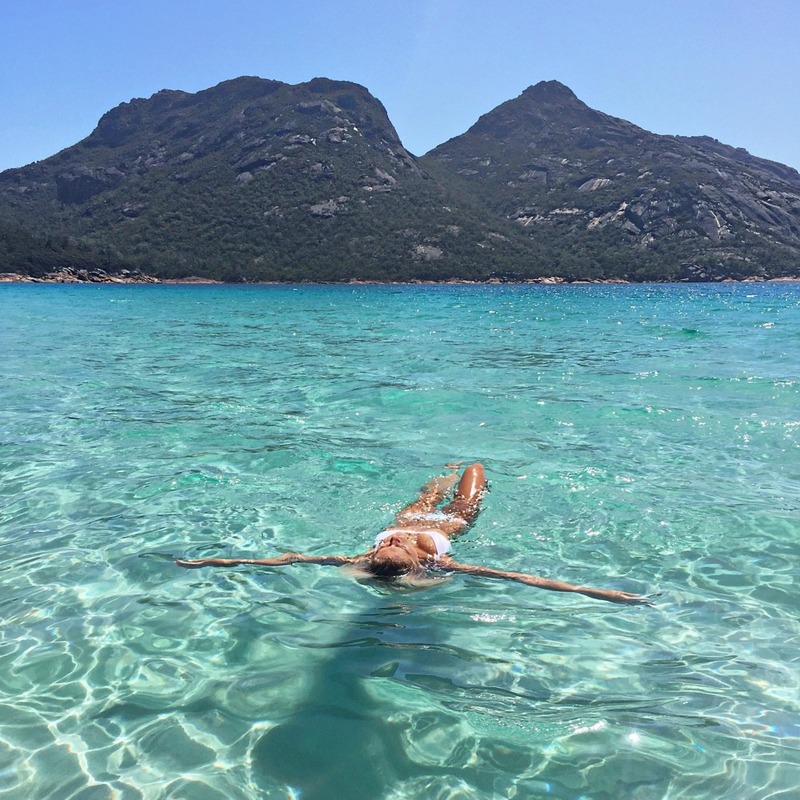 Elise discovered that when she and Domenic arrived at Wineglass Bay on a perfect summer’s day to find that they were the only people on the whole beach. 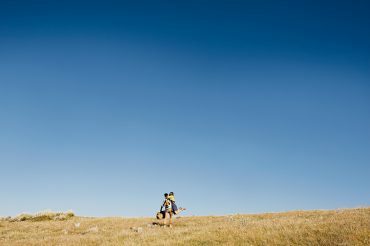 The image of Elise that Domenic took that day captures a moment that neither of them will ever forget. Wineglass Bay is known all over the world as one of Tasmania’s most incredible beaches. But this is a region with hundreds of kilometres of coastline, and more stunning bays and coves than you can imagine. Some are world famous, some have a modest signpost, and some are just natural clefts in the coastline that rival the beauty of any the world’s most photographed coastal resorts. This week, we’d like to introduce you to three of our favourite beautiful, unexpected and uncrowded beaches on Tasmania’s east coast. But there’s a disclaimer. This is a very difficult choice as there are so many wonderful beach nooks along the Great Eastern Drive. 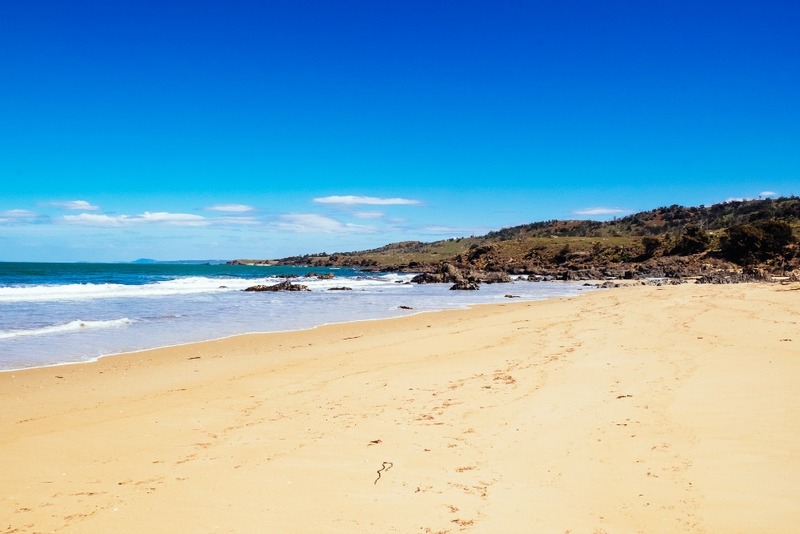 As you drive through Rocky Hills, just before Swansea on the Great Eastern Drive, you’ll find the Mayfield Bay Coastal Reserve and the lovely Mayfield Beach. Travellers often miss this delightful part of the coast, as they fix their sights on the next town along the Great Eastern Drive. But it’s well worth taking some time to explore here. Pull into the car park just off the highway and wander down onto the fine white sandy beach that skirts the edge of Mayfield Bay. Allow several minutes to take in the breathtaking outlook towards Maria Island before you commence your wandering. This is a beach for strolling slowly, examining shells and rock pools and getting the sand between your toes. Stop to see the 1845, convict-built Three Arch Bridge—preserved today beneath the existing highway, and wander along the beach to explore. Unpack a picnic, pull out your camera and take some time to soak up all the loveliness. A little further along the highway, you’ll see signposts to Spiky Bridge—a wonderful, quirky piece of colonial architecture that was built from local fieldstone by a convict road gang in the 1840s, and is well worth a look. On the opposite side of the highway, a little further along, look for the sign to Spiky Beach and turn off into the unsealed car park. A short walking track weaves down from here towards this truly beautiful, 100-metre-long beach. Spiky Beach is a scoop of platinum blond sand, embraced by dark dolerite outcrops and a small cluster of she-oaks and eucalypts. A tumble of sea-worn rocks on the beach create little nooks and shelters to nestle into, and offers exquisite rock pools—miniature gardens of anemones, shells and delicate aquatic plants. The water is clear and blue and the whole effect is like a storybook beach. This is a perfect spot for sitting quietly and reflecting, dozing in between dipping your toes and watching the sky and sea change colours. About five kilometres south of Swansea, on the Great Eastern Drive, look for the signs to Cressy Beach and pull off the highway into the little circular car park and picnic area here. 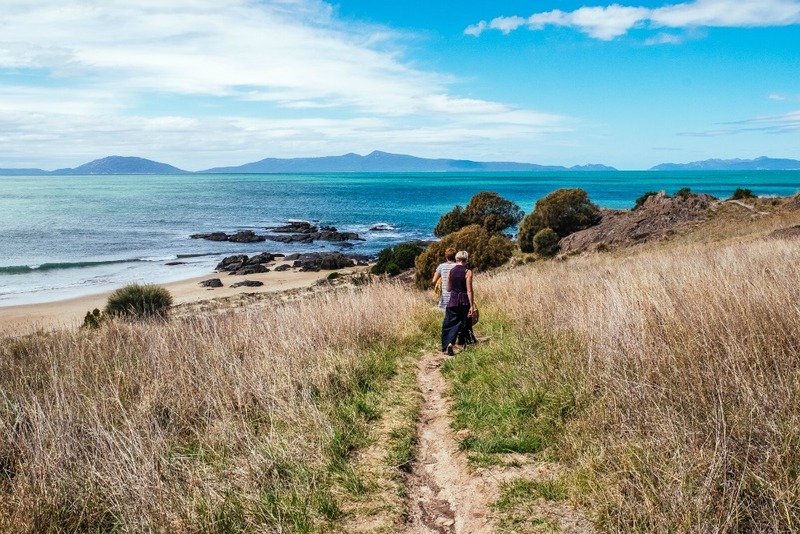 A short stroll along the sandy walking trail leads to the 500-metre-long beach, part of a small coastal reserve. 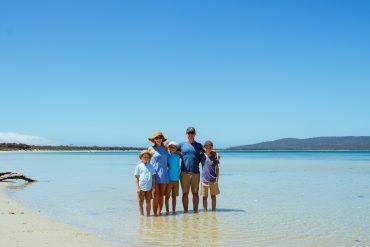 This beach has a different character to Spiky Beach, with a long stretch of sugary sand to stroll along, fantastic views of the Freycinet coast and ocean that can roll small, but surfable, waves onto the beach. This is a wonderful spot to take a longer walk and do some beachcombing or unfurl a towel and watch the sea birds soaring over the water. These are just three of the east coast’s surprising little beach nooks—all located within a few minutes’ drive of each other. 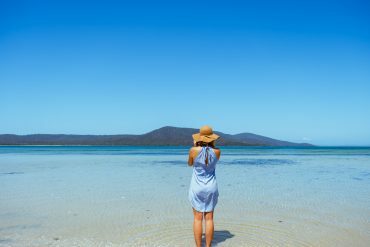 But there are so many more beaches on Tasmania’s east coast that are just as beautiful and that will entice you to stay for a day, a weekend or longer and feel the ordinary world disappear. All you need to do is take your time along the Great Eastern Drive, stop and explore. Which is just what Elise and Dom did—and that ended up being their best holiday, ever. 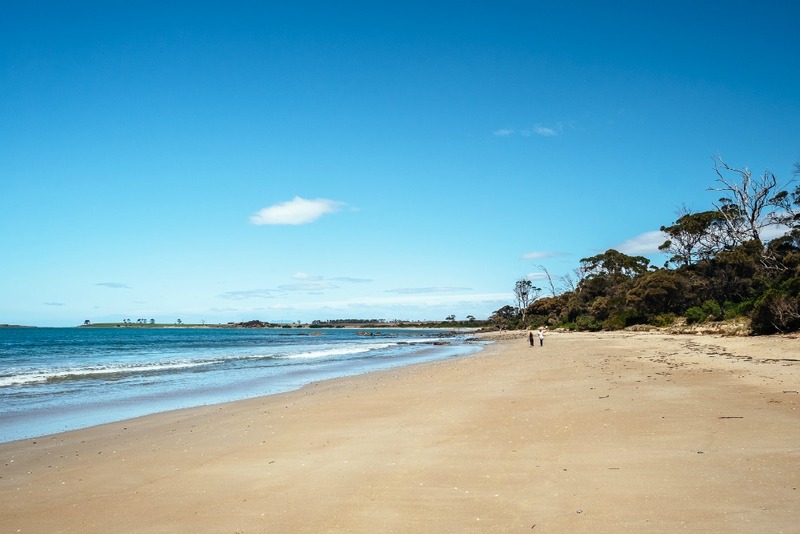 You’ll find a range of accommodation around Rocky Hills and Swansea, from camping in the Mayfield Bay Coastal Reserve to exclusive, private coastal retreats and everything in between. Check our Where to stay page to find out more. If you grow weary of relaxing on perfectly beautiful beaches, there are endless things to do in this area, including visiting wineries and cellar doors, tasting fresh produce at a local fruit farm, sampling fresh east coast oysters at a marine farm, walking, cycling, kayaking and browsing the galleries, shops, cafes and restaurants of nearby Swansea. You can find out more by checking our Things to Do page. 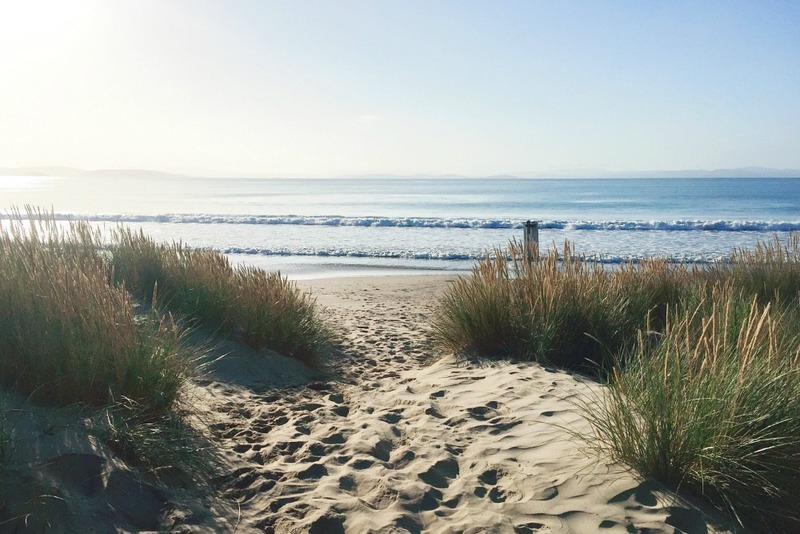 You could spend just one day popping along to all the lovely beaches on this part of the coast (or any other), but a far more restful and enjoyable way to experience the east coast’s beaches is to take some time to linger in the area and really explore. Factor in a full day to explore one or two beaches, armed with a picnic basket stocked with east coast goodies, local wine, a blanket, good book and your camera. 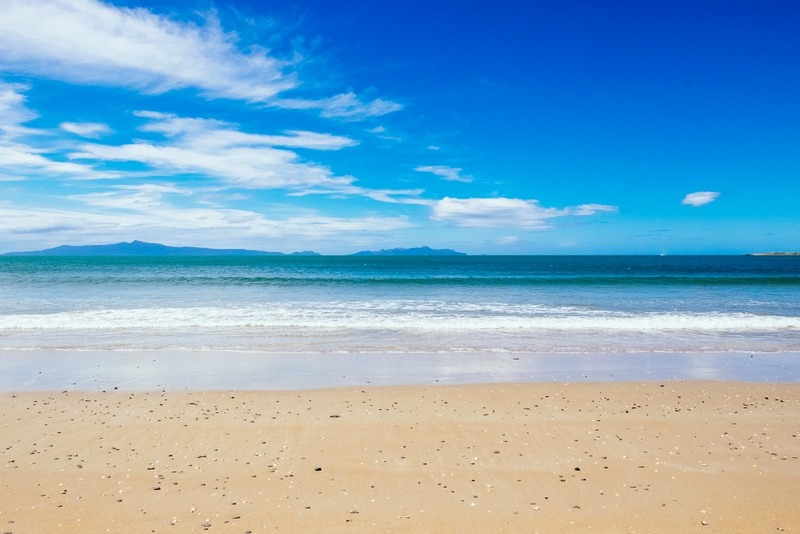 Some of the most beautiful beaches are less obvious, so take your time driving and keep watch for signs leading off to day use areas or beach car parks. If you’re spending time on this part of the coast, there is absolutely no excuse for not visiting the local wineries! Lunch at Devil’s Corner Cellar Door can easily turn into a whole afternoon of savouring delicious gourmet pizza and coffee from Tombolo and freshly shucked Freycinet Marine Farm oysters from The Fishers, while you sample Devil’s Corner wines and gaze at one the best views on the east coast. You can also visit Springvale Wines to experience their pop up restaurant among the vines, featuring east coast seafood paired with Spring Vale’s vintages. Take some time to explore other wineries along the Great Eastern Drive—check our food and wine section to find out more. Basing yourself in a particular part of the coast for a few days gives you time to explore the area more deeply and soak up extra hours on those beautiful beaches. There is a huge range of available accommodation all along the Great Eastern Drive, so you can select the style and location that suits you best. With all that coastline, you’ll have no trouble finding a place to stay that puts you right beside some of the region’s best beaches. In our next blog, we’ll travel north along the Great Eastern Drive on a road trip to explore the beaches and towns of Tasmania’s beautiful surf coast.